Betty Makharinsky is a British-Russian soprano who trained at the Guildhall School of Music and Drama; she previously received a First Class Music BA from the University of Oxford (Exeter College). Concert appearances have included several performances for the 2018 Suoni dal Golfo Festival in Italy and soprano solos at London venues including Cadogan Hall, St. John’s Smith Square, St Martin-in-the-Fields, the Victoria & Albert Museum, and Queen’s House Greenwich. 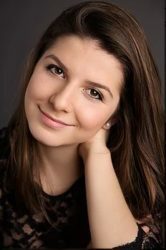 Betty greatly enjoys singing contemporary repertoire and she regularly returns to Oxford University to perform with pianist Jonathan Powell for composition workshops. She also collaborates with Jonathan on recordings and performances of songs by lesser-known Russian composers of the early 20th Century; they have performed together at Pushkin House in London and at Queen’s College in Oxford. In 2019, appearances will include a recital at the Jacqueline du Pré Music Building in Oxford. We welcome Betty to her first appearance at the Indian Summer in Levoča Festival. Copyright © o. z. Levočské babie leto 2018. Event photography reproduced by kind permission of Keith Page. Performer photos copyright individual performers.